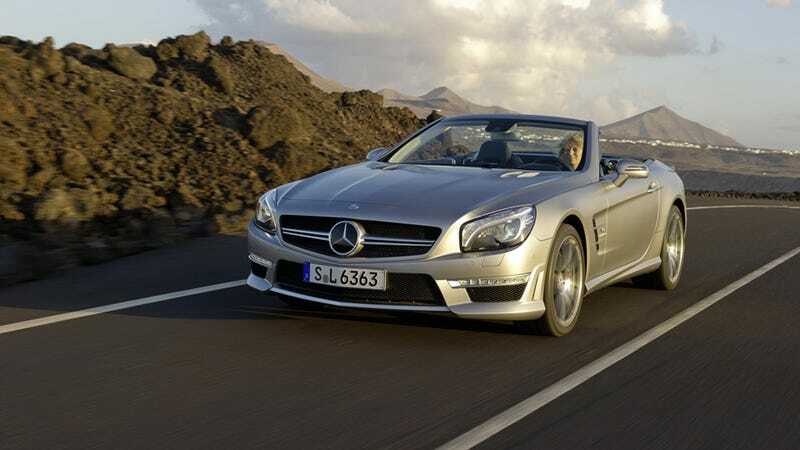 Mercedes teased us with a glimpse of the 2013 Mercedes SL63 AMG yesterday at the company's F1 car launch, and now they're giving the AMG convertible the full press treatment. Look at it cradling these studio drivers with back-pulsing seats and a twin-turbo V8. Strictly speaking, we can't prove that either of these drivers is enjoying the SL's massage function that "can slowly pulse the lumbar supports to help prevent fatigue on longer drives," but it's features like this that bump up the weight of this 529 horsepower superconvertible to over 4,000 pounds in spite of aluminum/magnesium construction. If you've got it, you might as well use it, right?